After an accident left her disabled, Laura Remblance took to crocheting to cope. She has now turned her hobby into a full-time, fully-fledged business thanks to MENTA’s free business skills training. Laura, founder of Lovingly Handmade Crochet, was nervous about starting a business. She creates lifelike ‘plushy’ cuddly toy versions of people’s pets. The plush toys are also purchased as memorial gifts after a pet has died. The 30-year-old didn’t know whether her hobby-turned-business venture would work. With health concerns and little idea of how to start a business, Laura decided to try MENTA’s start-up workshops as her initial approach to setting up had been directionless. Fiancée, Riccardo Veronese left work to care for Laura and as the demand for plushies grew, Riccardo took up his own crochet hook. He is now an integral part of this start-up which has expanded, selling via online platforms such as notonthehighstreet.com where the products reach a wider range of potential customers. The plushies take from 50, to 60 hours to complete and each one is unique with clients providing photographs of their pets as reference for Laura and Riccardo. As well as the plushy range, Laura sells other products that focus on inclusivity and diversity. These include bespoke, crocheted dolls and toys made to order as keepsakes. 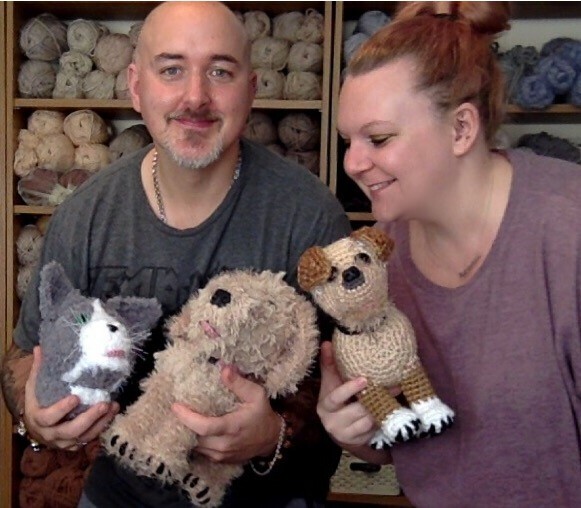 Despite her collection of crochet figures, Laura’s pet plushies are central to the heart of the business. For more details regarding MENTA’s free business skills training, dates and locations across Suffolk and Norfolk visit www.menta.org.uk and the start-up page or call 01284 760206.